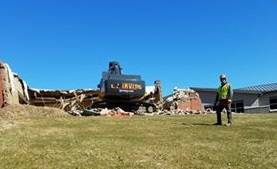 BELLVILLE – The first bit of the 100 year-old elementary school building in Bellville was taken down Monday. The gym area, to the east of the building, was the first removed by a crew from L. J. Irving, of Napoleon. That old section was home to plays, seminars, and of course, sporting events. Jesse Gaines, of L. J. Irving, said his crew had worked on items on the interior on Monday because some things needed to be handled carefully. Pieces of copper and other metals were handled Monday, Gaines said. Copper is valuable, plus many people in the area are interested in getting some souvenirs from the old building. Handling the “deconstruction” this way is best, Gaines said, because it makes available a pad area on that side of the building. Eventually a larger crane, a “high reach” piece of equipment, will be brought in to work on the higher areas of the building. The old building has a high turret-like area. People watching the effort to take down the building had talked about not wanting to see some parts of that structure go. Gaines had a crew of four laborers Tuesday. The preliminary “deconstruction” efforts will take about two weeks, he said. The owners of L. J. Irving, Larry or Marty, will be on site toward the end of the project. Gaines uses the term “deconstruction” because that is a more appropriate way to describe the demolition process. He said it is not “smash and grab,” and that layers of the old structure will be peeled back. It is a “responsible” way of taking down a building, Gaines said. He is aware that there is a lot of emotional attachment to such an old structure. He said it is a shame such a building can’t be “rehabbed,” but that effort would be far too costly. Gaines and another worker were at the site last week working on “staging” the deconstruction process. Clayton Bockleman worked with Gaines there last week. Workers with varying skill levels will work on the project, Gaines said. The people who use the cranes are specifically trained. Other workers are general laborers, he said. Gaines, who has been the major contact person in the project, said he is the “personality” there, because he performs “catch all” duties. 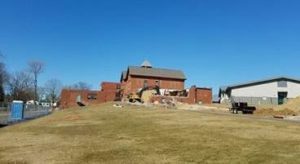 From the east, you could see portions of the new elementary building, butting up against the old structure. It is a striking contrast of gray and green — the new colors — and old red brick, for the old building.